This remedy is one that I am currently experimenting with for myself. Now that I have seen some success with it, I decided to write about it. Unfortunately, I have a genetic predisposition toward the development of lipomas, also called fatty tumors in English. The Deitsch term for "fatty tumor" is der Fettichgschwulscht. Although lipomas are not, in most instances, dangerous, they can be uncomfortable and unsightly. In the past, I have had a number of these removed surgically. These days, I have been experimenting with different combinations of herbs. The current combination has been working well, and I am attributing much of this success to the new player in the regimen. The earlier players in the regimen are Milk Thistle Phytosome, Bio-Curcumin Phytosome (Turmeric Root Extract), and Apple Cider Vinegar. These are all very powerful and effective herbs or natural products for numerous reasons. However, I had not really noticed a reduction in the size of a couple of lipomas that were of particular concern to me. 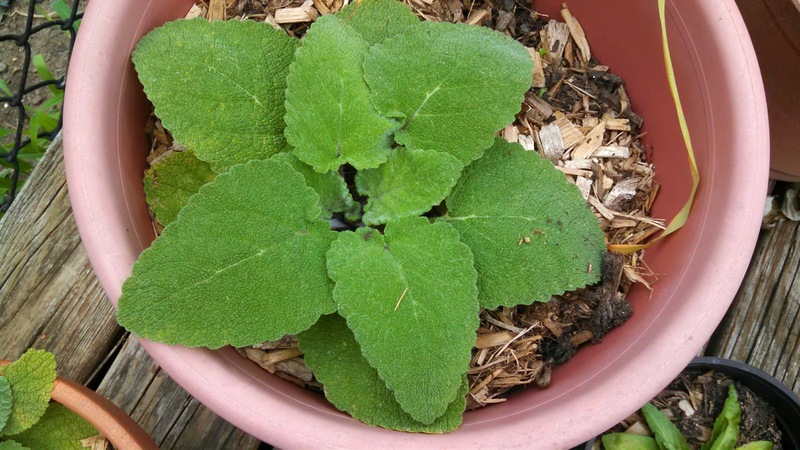 Last week, I strained a tincture of Clary Sage (tax: Salvia sclarea). This herb has several names in Deitsch, none of which seems to have a prominence over the others. Among the names are Glaarersalwei (clear sage), Muschgatelsalwei (muscatel sage), Glaaresaag (clear eye), and the one that I prefer: Ludersalwei (carrion sage). The reason I prefer that name is because, quite honestly, the plant reeks when cut or even when mussed up. When harvested, it also can leave a resin on the skin that carries the odor with it. Some people really like the plant's scent, but I am not crazy about it. However, I am very fond of this plant's power. This plant is in the Lamiaceae, or mint family. It is the largest mint that I have ever grown in my garden. It takes up a lot of space. It can grow to three feet tall, and the main stems of the plant can be 3/4" thick. Here in PA, the plant is biennial, and its aerial parts are harvested in the second year. Because of the large space requirements of the plant, I did not plan on growing it this year. However, I have found that a few plants have self-seeded in pots on my deck, and I am happy to let them grow there. I wish I had pictures of the plants that grew here before. The flowers were stunning, and the size was incredible. However, for now I will have to share a picture sourced from Wikimedia Commons and for a picture of one of the small plants I found in a pot outside. So, here is how I am currently using the tincture of this herb. I have added the tincture to a light cream base that serves as a carrier into the skin. This is not a very scientific way of doing it at this stage, but it is still experimental. I take the cream mixture with me to work or wherever I go, and I apply it liberally to the affected sites as many times a day as I am able to. When I am home, I also follow the application of the cream up with a direct application of the tincture to the affected site. Please note the disclaimer below. Disclaimer: This information is for educational and discussion purposes only. Nothing in these posts is intended to constitute, or should be considered, medical advice or to serve as a substitute for the advice of a physician or other qualified health care provider. The aerial parts of Solomon's Seal can be toxic when consumed internally. Please consult with a licensed medical professional. CLARY SAGE SHOULD BE AVOIDED WHILE PREGNANT, AND THE ESSENTIAL OIL SHOULD NEVER BE TAKEN INTERNALLY. I have been using it consistently for a week on four sites. The lipomas have become softer and smaller, with one almost disappearing. The largest one is half of its original size. Since I am now noting success personally with this herb, I plan to create salves and creams that contain it. I should mention that the tincture and the cream do not smell as bad as, in my opinion, the plant does. I frequently will utilize Braucherei incantations with the application of the herb. A link to the relevant charms will be added here when a respective article is posted on Braucherei.org.